AREF research endeavors are largely directed toward injury prevention and regenerative medicine. Our clinical trials and research studies use a multidisciplinary approach to find solutions for problems encountered. The biomechanics lab is made up of the following divisions: applied research; musculoskeletal mechanics; and exercise physiology and kinesiology. Each division is used in conjunction to formulate personalized rehabilitation protocols, return to play considerations, and encourage proper body mechanics. Vicon Nexus 3-D Motion Capture system with 13 cameras, 4 Bertec force platforms, Treadmetrix instrumented treadmill, Noraxon DTS Telemetered 16 channel EMG system, Zerowire Telemetered 8 channel EMG system, Visual3D software. Instron 5565 Electromechanical materials testing machine. We believe everyone is an athlete exhibiting different levels of performance and skill. Whether a beginner or an elite athlete, everyone can be improved. An active lifestyle and participation in sports have inherent risk. Each person handles the workloads placed on their bodies in a different manner. The introduction of an injury or improvement in performance will vary of each individual. We strive to find a better approach to look at health and wellness. We hope to create paths for better fitness and lead to improvements in overall health. Our department and its plethora of research tools and more importantly intellectual talent provide us the diversity and capacity to be successful in assisting you reach your goals. Our lab research and evaluations encompass a wide range of activities and movements. Our resources provide us the flexibility and capabilities to capture movement data integrated with force and EMG data over range of activities from ergonomics to professional sports actions. We have completed studies and analysis of fire fighter occupational range of movement and assisted in data capture of elite level performances to determine return to professional play recommendations. Our team can design effective protocols to test equipment or conduct valid scientific research. We work with our physicians, physical therapists, and other team members to utilize our lab to enhance and improve the quality of care given to each patient. Astellas Pharma, Bayer Stryker, Wyeth, Human Genome Sciences, Ortech International, Otsuka, United Therapeutics, Bayer Pharmaceuticals, Genzyme, Sanofi Aventis, Takeda, Sigma Tau, Johnson & Johnson, Zymogenetics, Angiotech, Diffusion, KOWA Research Institute, Yale University- Virgo Study. 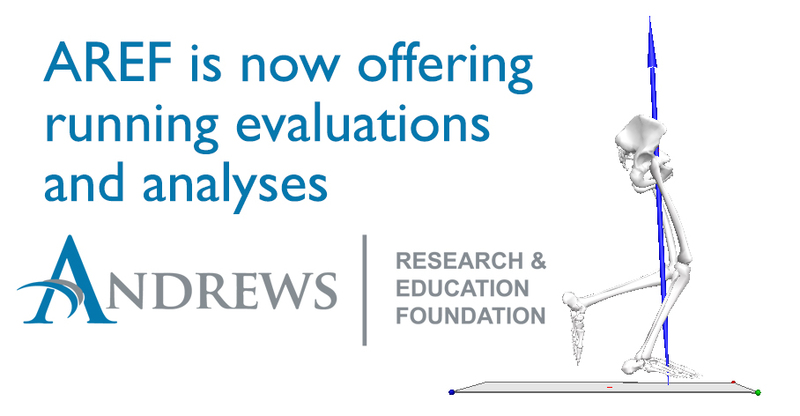 © 2006 - 2019 Andrews Research & Education Foundation.